The policy of the Hastings Public Schools is to encourage use of its facilities by district residents. The Community Use of School Facilities Philosophy, Rules and Regulations have been reviewed and updated by the Community Education Advisory Council. Updates have been made, learn more about them here: Facilities notification. Please review the Community Use of Facilities Policies below. The policies have been written into two seperate parts, one for July 1 – December 31, 2018 and the other for January 1 – June 30, 2019. This is to allow enough notification time to groups of any changes. To use a school district facility, you or your organization must submit a Facilities Request Form. For gym or auditorium requests, email your request form to tthompson@hastings.k12.mn.us. You may also fax your permit request to to the attention of Teri Thompson at 651-480-7680 or mail it to Teri Thompson, Tilden Community Center, 310 River Street, Hastings, MN 55033. No facility requests for 2018-19 will be accepted until after August 15, 2018, and then processed in a timely manner. Please do not promote events for requested dates/facilities until you have received confirmation of your requests. Only completed permit requests will be processed. Requests are not taken over the phone. Please do not advertise your event until you have received your permit via email. 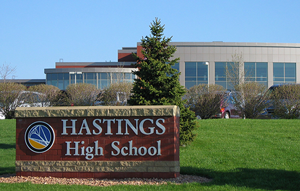 Remember that the Hastings School District always has priority use of buildings. You can check to see if a date is available at hastings.thatscommunityed.com/facilities/calendar. You must still request your date by submitting a permit. You will receive your permit via email within 72 hours. Exceptions may be for requests at the Hastings High School Field House, Hastings High School Performing Arts Area, Hastings Middle School Auditorium. These permit requests must be approved by school personnel outside Community Education before they are issued, so occasionally there is a longer wait time for processing. INCIDENT or INJURY REPORT FORM – If an incident or injury occurs while you or your organization are using a school facility, please submit an incident/injury report.